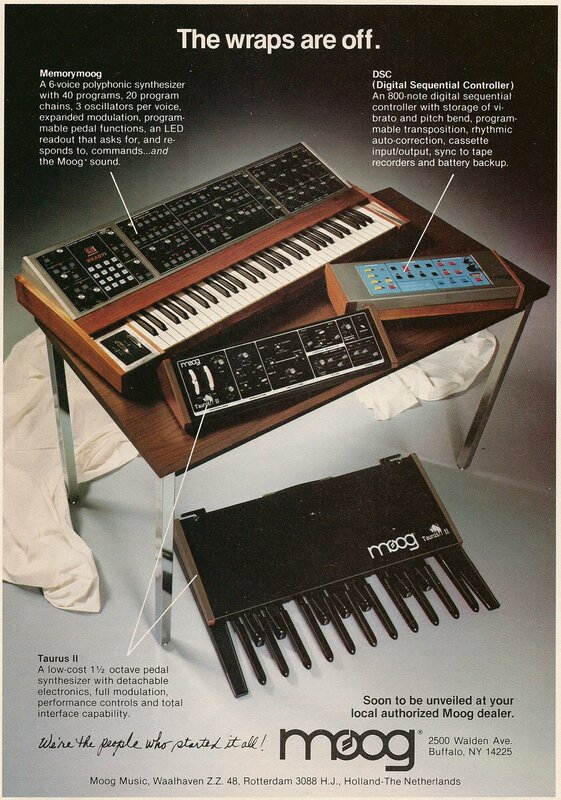 Moog "The finest new Moogs you've ever seen" black & white advertisement including Memorymoog, Taurus II and DSC (Digital Sequential Controller) from page 55 in the January 1982 issue of Keyboard Magazine. Just in the process of filling in a few embarrassing holes in my early 80s Moog ads - and this is a big hole. It all started when I woke up the other morning and was reading the Synthesizer Freaks Facebook group. 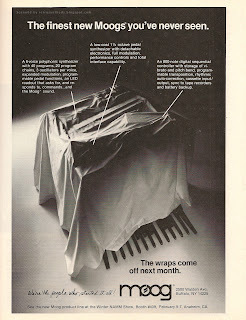 Someone had posted this Moog advertisement and I got excited to add my 2 cents because I recalled that it was actually the first in a pair of ads - the second "reveal" ad appearing in the following February issue. I went to the blog and found the second ad, but oddly, that post didn't reference the first ad. When I went too find this first ad it became apparent that I NEVER POSTED IT!!! What the heck?!?! Well, fixed that! And glad I did. I enjoy this short series of ads a lot. First, looking at the both side by side you can see they have that Wizard of Oz thing going on - first ad in black & white - second ad in colour. Like Moog has just dropped their new products onto the Wicked Witch of the West. Next - the descriptions for the three hidden items make me drool as much now as it probably did when I read the ad the first time. Especially the low-cost pedal synthesizer with DETACHABLE electronics. Yum. Also, the reference librarian in me likes any advertisement that specifically references other events occurring around the time the ad is published. In this case - Winter NAMM show, Booth #409, February 5-7. Well, happy to tie off that loose end!